Guys there’s nothing funny about making a mess and unfortunately even someone with my experience and expertise has to deal with a spill on occasion. I hope by sharing my own recent horrifying experience I can guide some less stable chefs through emotionally trying kitchen catastrophes. I began my day by preparing an egg dish for myself that called for two eggs soft-boiled. It looks like I haven’t made a mistake and am well on my way to enjoying a professional egg breakfast. 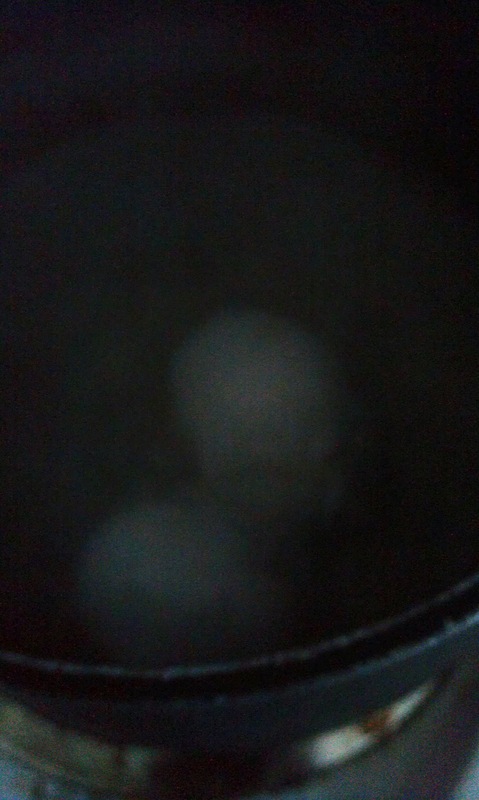 I have two eggs boiling like the recipe calls for but this picture is deceptive guys. I made a mistake. 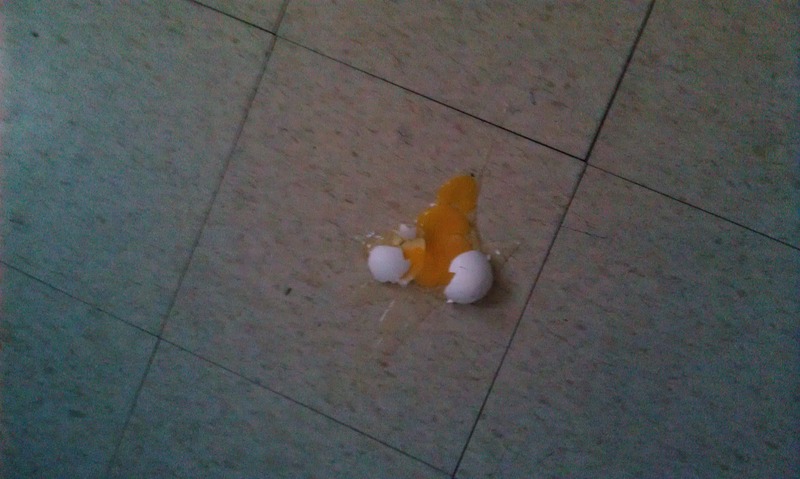 This egg fell right out of my dexterous hands and onto my kitchen floor. A paralyzing sensation shot through my spine like lightning and I was overtaken by a profound dizziness. I wanted to call for help but I couldn’t shake the fear that no one would come. 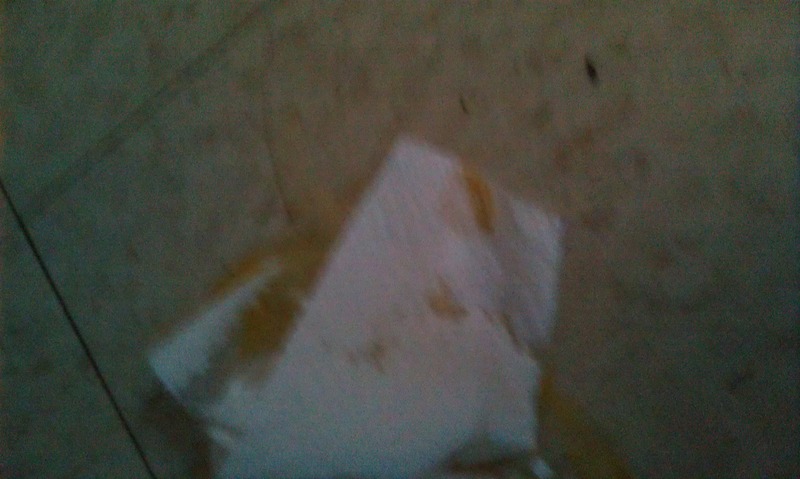 As I wipe the yolk with a paper towel visions from my past haunt me. I’ve done this before. This isn’t the first mistake I’ve made. How many messes have I cleaned up? They all look the same. If I do a good enough job no one else will have to know about this. Guys, it’s important to use just one sheet of paper towel and fold it in half. Using two sheets is wasteful, it isn’t the surface area that gets the job done so much as the two-ply thickness. 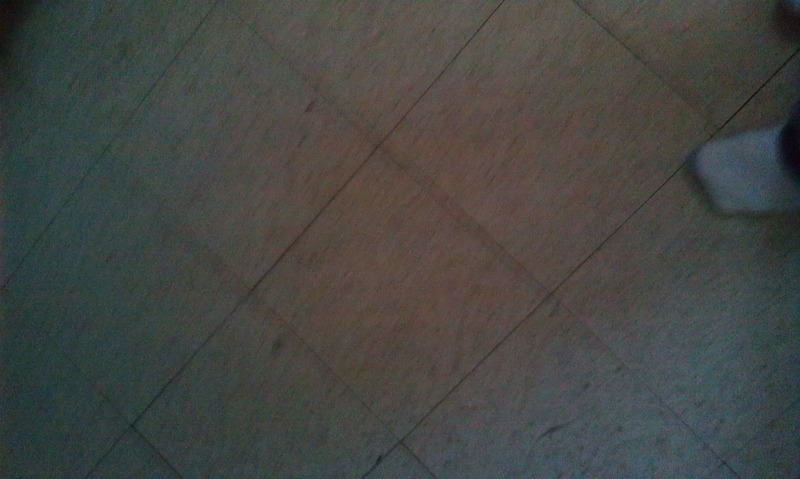 In no time at all my floor is sparking clean and I can take pride in my kitchen once more. Oh, and in case you’re wondering my egg breakfast was absolutely delicious. But that goes without saying. Give your kitchen a quick scan and see if you can’t make it look just a little bit cleaner with an effortless paper towel rub down. There Is Nothing Worse Than When Somebody Uses More Than One Paper Towel To Clean Up The Mess Of A Single Egg. You talk about waste?! Why not use a spatula to rescue that egg from the floor? Scrambled eggs are delicious; cooking kills any germs -I’m sure, but I’m equally sure the floor is clean enough to eat off of. As for shell fragments, it is just as entertaining to remove them from eggs as bones from fish. Please be more frugal in the future. A chicken should not die in vain! Only you could make it look so effortless. Nice going DWD!